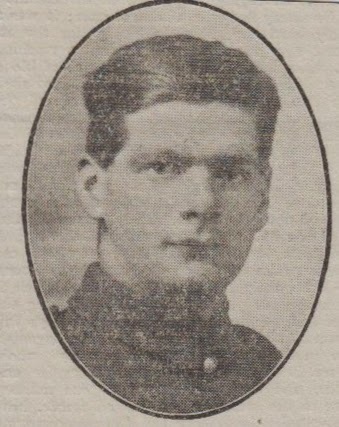 Information has been received this week of the death in action of Private John Pyle, son of Mr and mrs. William Pyle, 18 Heys Street, Haslingden. He belonged to the East Lancashire Regt., and had been at the front only three weeks. The notice intimates that he died at a place not stated on September 13th, and was killed in action. He was 22 years of age last January. He enlisted nearly twelve months ago, and was previously a spinner at Carr and Parker's Mill. He was brought up at the Parish Church, which he regularly attended. A brother of the deceased, Private George Pyle (26) was killed in action fifteen months ago. The parents received a letter from the deceased dated September 11th. Another brother, William Arthur Pyle (25) is also in the Army, while the father's sister (Mrs, May, of Barry near Cardiff) has lost two sons in the war, the eldest being drowned and the other being killed in action. In loving memory of Private John Pyle, East Lancashire Regiment, who was killed in action at Salonica, Septemner 13th 1916. May God grant him Eternal rest." From his loving Brother Arthur, serving in Salonica, and his Sisters in law Florrie and Maria. He will never be forgot." Sadly missed by his dear Father and Mother. Missed by those who loved them best. From those who loved them best." Can he not reach thee with His tender care. Can He not hear me when for thee I pray. The hollow of His hand all worlds, all space. That thou art done with earthly pain and sin? Somewhere within His ken thou hast a place. That thou must pass to reach the hills sublime! In God's great universe thou art today. From his loving Father and Mother, Sister and Brother, William Arthur (in Palestine). Have gained what we have lost. For him we shed a silent tear. Sadly missed by his sorrowing father, mother, brothers and sister. "God bless him, he was one of the best. We hope their joys will never cease. From loving father and mother, brothers and sister.